Learning that your dog needs to have a leg amputated is very scary. 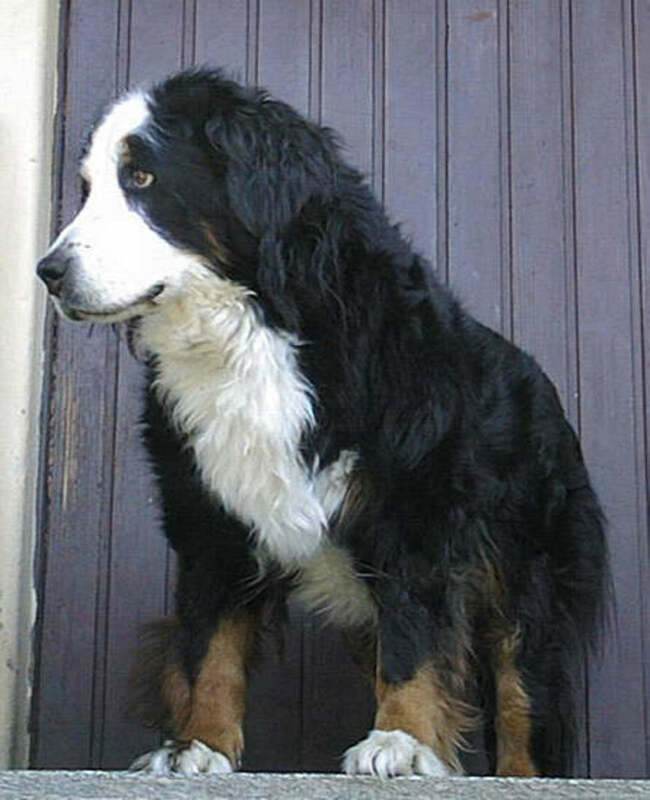 The good news is that dogs, even senior dogs, adapt to having three legs quite quickly. They find their new center of balance and can run and play just like four-legged dogs. 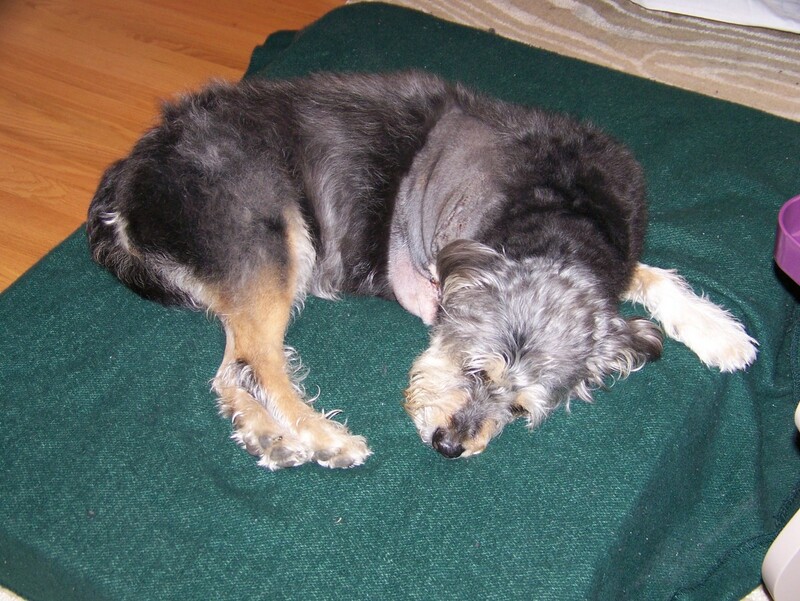 Additionally, some dogs are more mobile after their surgery. For example, a dog with a bone tumor in her leg may limp and experience pain; you may not allow her to run or jump so that there is less risk of the bone breaking. But, after the amputation and healing period, she can go back to running and jumping and playing. Before the surgery, the vet will provide information on what you need to do to prepare. Talk to your vet about whether or not you should give your dog medication. You should also ask when your dog must stop eating and drinking. When you pick up your dog from the vet, be prepared to see a scared, confused dog. Be as happy and as normal as you can be when you greet your dog. When you pick up your dog from the vet, will your dog be able to easily get into your car or SUV? If your dog is big and has trouble, will you be able to pick her up? It is much easier if you bring someone with you. The other person can help maneuver the dog into the car and can also sit in the back with your dog to comfort and steady her. It may be difficult for your dog to steady herself as you take turns or stop and go with traffic. Bring a towel or sheet. You can put a large towel under the dog and hold both ends of the towel up (like a giant sling) in order to help your dog walk from the vet to the car. When you arrive home, it may be difficult to get a large dog out of the car. Be careful when picking your dog up. Try to park as close to your house as you can. On the way to the door, it's best to make a pit stop for your dog to relieve herself if necessary, too. Get it out of the way now, while you're already outside. 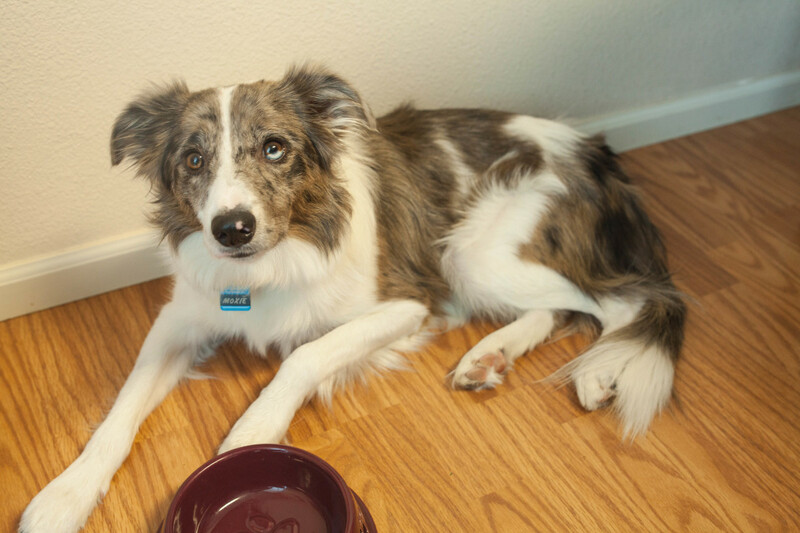 If you have wood or tile floors, put a path of carpet or rug between the door and the place where your dog will rest. You do not want your dog to slip and fall onto her incision. Consider putting a blanket on the floor or dog bed in case there is any blood. Offer your dog water often. Give your dog medicine and painkillers, as needed. Try to get your dog to eat something. Your dog might not want to eat at all, so try the smelliest food that they like. Simple baby food like mashed turkey or ham may work the best. Make sure the baby food does not contain onions, which are toxic. Buy a variety of cheeses, too. A smoked cheese like gouda might smell stronger and be more appealing. Don't keep food right in front of your dog's head if she doesn't eat. Just offer it often, but don't overwhelm her. She'll move her head away from the food if she isn't interested. Until the stitches are out, keep your dog calm; she shouldn't run, even if you're happy to see her get her energy back. You may want to order a harness that she can wear once the stitches are out. 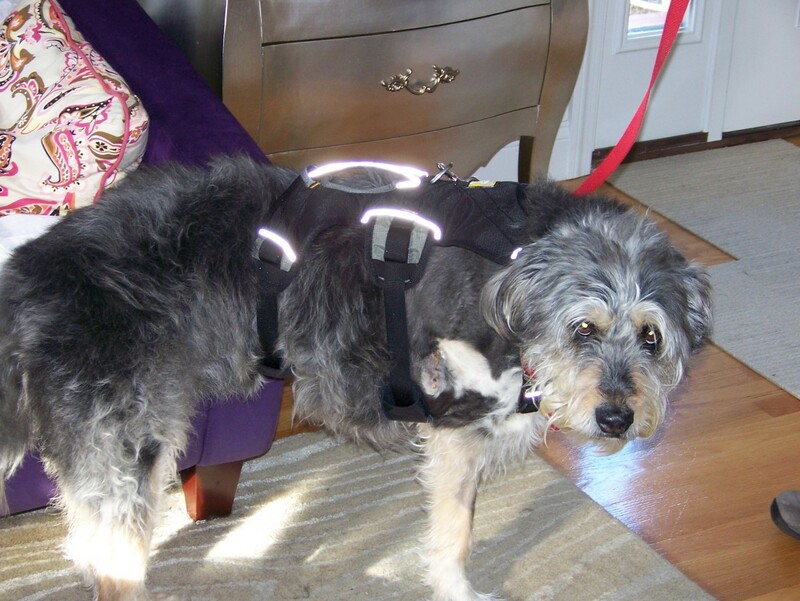 Order the harness in advance so it arrives by the time the stitches are removed. Ruffwear makes a great harness called the Web Master (TM) Harness. It is so much easier to walk a dog with a front leg amputation if you put the leash on a harness vs. the collar. When the leash is on the collar, there is too much bounce in your dog's step; the bouncing leash will probably annoy her and you. A great trick is to put modular carpet tiles where needed. Put carpet tiles in front of doors, in front of her food and water bowls, up the stairs, etc. FLOR carpet tiles work well and can be ordered online. If you cut the tiles in half, they will fit on your stairs. 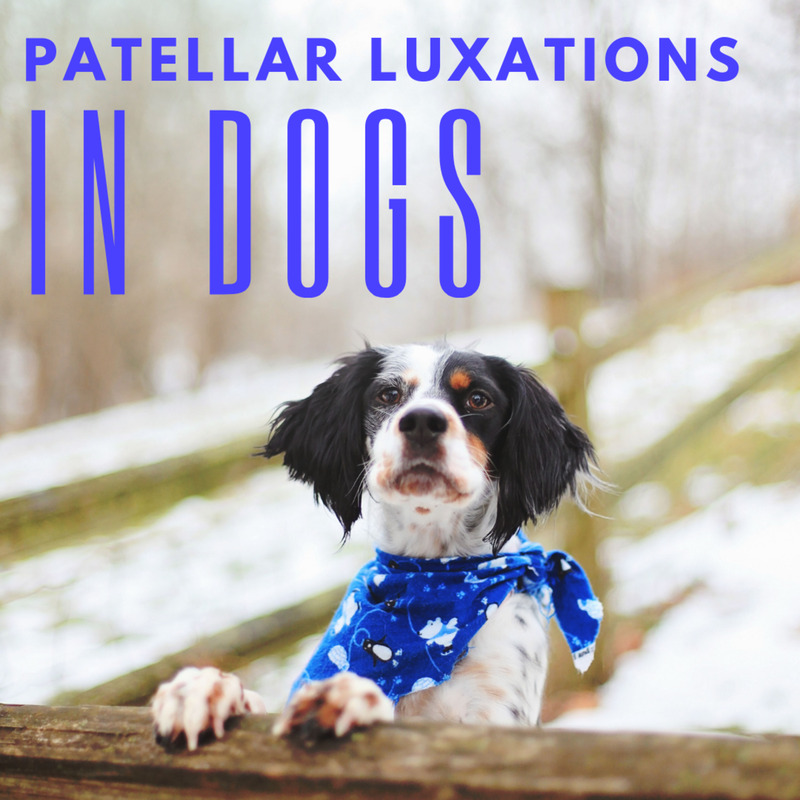 If you think your dog will wear them, boots may help with traction, too. Give your dog's food bowl a boost so that she doesn't need to lean all the way over to eat; this will make it comfier for her. If you think your dog will scratch her incision area and don't want her to wear a cone, put an old t-shirt on her. This may even make her more comfortable because it will protect her incision from the elements. Praise your dog for every step of progress she makes. Invite her favorite people over so that they can entertain her. If your dog seems bored because she can't take long walks yet, take her for a car ride. It will boost her spirits. Additionally, she'll get tired from trying to keep stable in the car, so she may rest better at home. Give your dog lots of pets and massages. Her muscles are probably very tired from being used in a new way. Even when you take her outside for quick breaks, massage her muscles when she rests. When walking, your dog might like it if you walk on her side or even have a fence on one side of her and you on the other. It will offer her a better sense of balance. 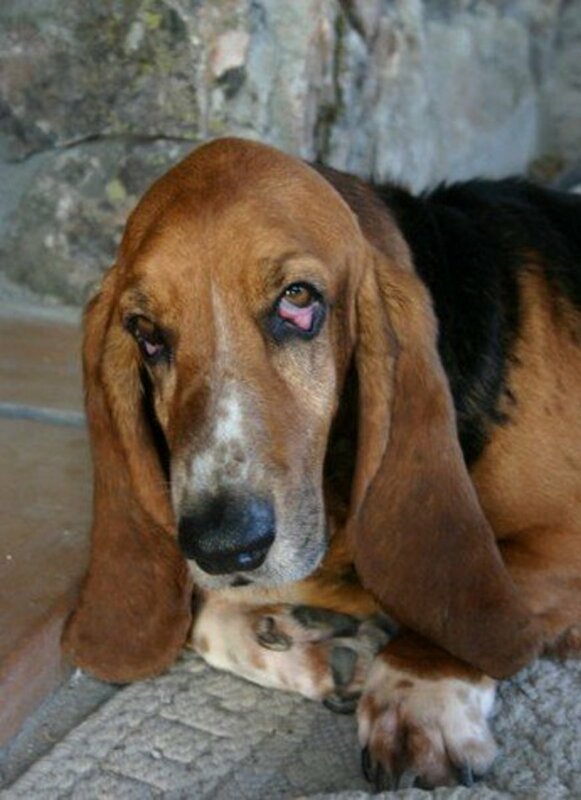 After the first two weeks, you should see a marked improvement in your dog. Once the stitches are out and you have your harness, you can begin taking your dog for longer walks. She may get tired quickly, and she may need a lot of breaks. You may notice that she has more energy going out than coming home. It's been so long since she's been out, and she wants to smell all of the new scents. One trick is to walk your dog in a circle instead of straight out and straight back; this keeps the environment more interesting for her. By now her appetite should be better, so you may also want to bring treats on your walk. Bil-Jac (the kind that is soft and you keep in your freezer) is a great treat. It will probably be easier for your dog to run than it is for her to walk. In no time, your dog will be sprinting again. Depending on how long your dog's fur is, it may take several months for her fur to grow back. Another interesting point: people who never showed interest in your dog before may start petting her, while some other people won't even notice that she only has three legs. What is your opinion on a labradoodle who is almost 12 years old having a front leg amputation? Should age be a factor? Your vet would know best. But, I can say that my dog was 11 or 12 when she had her front leg amputation. She lived for another 2 years and loved life. My 10 yr old Coonhound mix is 8 days post op from left front limb amputation. He experiences what I think is phantom pain where he yelps in pain for no apparent reason. It also seems to hurt if he tries to bark. Is this normal? I have heard of phantom pain but do not know much about it. I don't think barking should hurt. Please follow up with his vet in case there is something you can help with. RezMama, I'm glad the vet thinks she's doing fine. Another consideration is that the pain medicine could also be making her more mellow and less hungry, if she's still taking it. I hope the pain fully subsides soon! 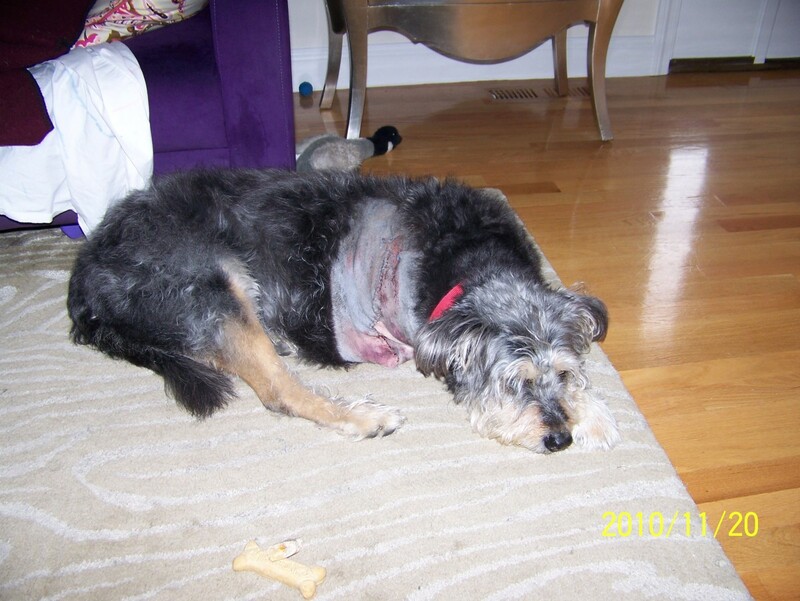 Alex, thank you for sharing Trixi's story! Inspirational! Hi RezMama. My chihuahua cross Jack-Russel, Trixi, also had to have her leg amputated. Although it was her left hind leg. This was over 7 years ago. In the beginning she also seemed sad. But I realized she is in pain and it is something to get use to. After about 2 weeks, she got use to only having 3 legs and started jumping and now runs faster and jumps higher than her sister. People don't even realize she only has 3 legs, because she adapted so well. Only after a while when really looking at her people go..... oh wow, what happened? She is so energetic and only having 3 legs has not dampened her spirit at all. Remember it is a traumatic event and although animals get over things much quicker than humans, we must still give them a little time to adjust. Wishing rocket all the best with his recovery. P.S keep him skinny, our vet said it may cause problems when they get over weight. Just found this page as I was searching for reassurance regarding my little chihuahua-mix named, Rocket. It seems like her healing is on track but these first several days have been tough. She just had a front leg amputation 4 days ago and she is miserable. The pain, actually seems to be subsiding but her spirit seems broken. She has little spindly legs and her remaining front leg will need to get beefed up a bit before she can walk with more confidence. Sometimes she falls over and then seems so sad. She hops around a bit and will eat and drink a little but only if I cajole her. She's had 1 follow up appointment and the vet says she's doing fine. I know it hasn't been very many days since surgery but it just breaks my heart to see her this way. I have hope that it will get better. I just really miss her spark and her goofy playfulness. For now, she's happy to spend hours at a time on my lap just sleeping. I'm hoping that every day will be a bit better. Hi Patti, sorry to hear about the fracture. I hope the tips in the article are helpful! I just found out my beautiful pup CoCo had to have her leg amputated due to a severe fracture that was unfixable. Any advice would be great. I’m devistated for my pup but I know in time she will be back to barking and running. Tips once she comes home would be great as well as what to expect. Samantha Lindsay, I'm glad that she seems to be doing better with the extra pain meds. It's so tough seeing our pups in pain. I hope this next week brings vast improvement. Thanks for this article. My dog (a Great Dane) just had her left front foreleg removed 4 days ago. The first day was horrible. Second day much better. Third not so great. I think the fentynal patch is wearing out. She didn’t sleep a wink last night until I got on the floor and held her for a few hours. We increased pain meds today due to her not sleeping (per pet recommendation). She’s sleeping now with her head on my lap. This has been the hardest four days I’ve ever experienced. I knew it’d be difficult but this has surpassed what I expected. I’m looking forward to these two weeks being done. Teresa W, yayyy! I'm so glad he's doing well! Kiri, thank you for your post. It has now been 11 days since Charlie’s surgery. He is learning his center of balance and getting around good, I think. We didn’t need the doggie diaper. He seems to have that under control. Sometimes he seems sad and looks pitiful but other than that I think we are on track based on what I’ve read. Thanks again! Teresa W, I hope Charlie is recovering well now. I've never tried a doggie diaper. If you think he'd use it, it wouldn't hurt! Good luck with everything! My 10 yo Maltese (Charlie) had his front leg amputated today because of recurrent sarcoma. We traveled 6 hrs from home for the procedure. I am nervous about the trip home and the recovery process. This was a very hard decision but the best option for a longer healthy life. Thank you for any tips you can give. I’m wondering if Charlie will need a doggie diaper. I will get him an elevated water and feed bowl if that will be helpful to him. I must admit I’m scared but am so anxious to have him back with me. Thank you for this helpful site. Gail, glad to hear Tex started eating and seems to be feeling better. I hope he's back to normal quickly! Our 12-1/2 yo greyhound broke his left shoulder. X-ray showed osteo so we opted for amputation. Our first greyhound had osteo and back leg had been amputated. She recovered quickly so we expected the same for Tex with a front leg. It’s different. It’s been 5 days since the surgery and he’s finally eating and seems to be feeling better. We have to remember that he’s no youngster and his back legs were shaky before the surgery. Hopefully we’ve passed the worst of it and he’ll show improvement daily. Prayers to everyone who is going through this hard time. Grandmama, I'm so glad to hear she's doing well! Our pup's harness would twist sometimes, too. Maybe buy dog steps for the sofa!? Great advice. I only wish I had read it before I brought my dog home from the vet. She is three weeks past surgery and doing very well. One thing I'm having difficulty with is that she now can jump up on the sofa (she is a toy poodle) but I'm afraid she will get hurt if she tries to jump down. She is my service dog but her vest twists around and won't stay in place. I will try the vest you recommended. Perhaps that will work better. Hi Gracie, I don't know about PT for amputations, but I bet there could be. I know a dog that gets physical therapy for his weak back legs via hydrotherapy. Did anyone's dog get physical therapy after front leg amputation? Wondering if there is such a thing for dogs? Hi Dan, I hope your dog recovers quickly and continues to adapt well! My yellow lab is having his front left leg amputated today due to bone cancer. We are hopeful for a good outcome but guarded against bad news. In the days leading up to this point, I noticed that, as he stopped using the leg because he was in so much pain, he had already adopted a new balancing method when he peed. I hope this is a sign of how he will adapt to being a tripawd. Marilyn, thanks for sharing your experience. It's so inspirational how they adapt so quickly. Our pug mix is 7 days post amputation of her leg and she is doing amazing. The first four days were painful. She was suffering from phantom pain. She would scream in pain just touching her on occasion but since then no crying or pain. We still have her on two pain pills a day and one anti inflammatory pill per day. She has been walking on her own since day one. I find that she loves to be cuddled now whereas the first few days even touching her was something that was difficult. I am glad we elected the surgery as dogs just adapt so much better than people. Thanks, Melissa. I wish your pup a speedy recovery! This is a very helpful article for us. I read it out loud to my husband on the eve of our 9 yr old black lab's front leg amputation tomorrow. So glad we go this valuable information. Thank you, will keep in touch when she comes home tomorrow. Dennipet, thank you for providing an update. You have a lot of good points/info in your comment. I'm so glad your pup got the extra time to be spoiled and to live life to the fullest. Tripaws really are inspirational. My baby unfortunately succumbed to cancer spreading to his lungs in 4.5 months from surgery. I did spoil him silly with chicken breasts, gruyere cheese, car rides, walks in the woods, love, etc. I will have to say it was worth it. If anyone needs to know, it sounded like a cold and he was coughing, I tried antibiotics and noticed he was getting tired and could only walk a short distance and needed rests. the next couple of days he could not walk and back legs were weak and so I would drag him on his dog mattress bed outside so he could pee and poop. I took him for his last ride and he mustered his way into the car as he wanted to go so badly,. he could not leave the car he was weak. the next day he barely ate breakfast and then ate no more. the next day he had worse trouble breathing and I called the vet to come and do euthanasia as he stopped drinking and was having trouble breathing. I buried him outside and he was 11.5. Value your time in quality versus quantity. I would do anything to save him and exhausted all options. The most important thing is it was worth doing the amputation surgery as he fought to live and once you are dead and lose consciousness, there is no life left and he would rather be with us than dead. Once they suffer, they need to be put down. he had struggle and that's ok but you will know when they cant go on. My vet charged me $1600 for the surgery and he has payment plans in NJ. Other places wanted $5500 and required hospitalization for a week or so. a lot of places are money hungry. I took my home 2 days post op and he was able to climb stairs and was very happy to be home.. I have to mention that he will not do the surgery if the lungs show cancer. Finally, if your dog has the amputation surgery, don't think it takes 2 weeks to recover like most online assessments saying after 6 days they are recovered. hair takes 6 months to grow back., they will be in pain for about 4-8 weeks post op but it gets better after 2 weeks. the bones have to heal after surgery and if hair takes awhile to grow, imagine the tissues take longer. if anyone has questions, ok to message me. Dennipet, thanks for providing an update. Hope everything from here on out is much better for your dog! Hi Dennipet, I'm not sure. Check with your vet or get a second opinion. Hope your dog feels better soon! my 11 year old dog had front leg amputation from tumor 11 days ago but is still in excruciating pain. opiates and gabapentin are not working. what could this be? does it take longer to heal or am I missing something? Faith, I'm glad the info was helpful. I wish your pup a speedy recovery! Hi Sarah, I'm glad everything went well during the first night. I did use a towel as a sling during the first couple days, especially when going down the few steps to the yard. But, once she was on the flat yard I didn't use it as much. Our pup slept on the first level of our house (on the rug or a firm dog bed) for several days because we didn't want to push her to go upstairs. We stayed by her side. I'm a nervous Nellie, too. We just had to have our 7 month old puppies back left leg amputated. I'm a nervous Nellie about it. I'm making sure to be right by him as he heals. It was his first night home last night everything went well. I do have to questions. Should I do the towel thing to help him get outside? Where was the best place for your pups to sleep during their healing? Hi Vickie, I think you should run it by a vet. Maybe there's something going on with the stitches. Hope your dog is okay! Our dog had his leg amputated two days ago. There is some blood seeping from part of the wound, is this normal? Hi Melanie, Great news to hear your dog is acclimating well. I remember my dog had trouble doing her business the first week...not only because she was learning how to get around on three legs but also because the medication seemed to slow her digestion down a bit. We started off using a towel as a sling to get her into the yard and then we let her stand by herself and take her time. I then ordered a harness for her and used it as soon as the stitches were out. Trina, definitely consult vets for more info on options. Hope everything works out well for your pup! My dog has had her front leg broken for 5 weeks now. They are saying it isnt healing at all and that she needs an amputation. Is surgery an option at this point or really any other options? Mario, hope all went well with your pup. Just had out Dane..pit mix front leg amputated . she had bone cancer and leg became useless after awhile...we kept it from spreading because we put in a zero carb diet....cancer never matastitized....picking her up tomorrow...... very hopeful she'll make a full recovery..
Chasity, good luck to you and your Maltipoo. Today my 1 year old Maltipoo had to have her leg amputated. I have cried all day. She is only 3.5lbs and I love her so much. She broke her leg while visiting with my family and I am still unsure how but after going to her Vet and getting a splint 7 weeks Lester still. It healed. Asked to change the splint and was told no need it was not wet. That was in Feb. the last few days my baby would not play and run around like she normally do so I found a vet near me because I am on a business trip and I learned from the last time not to leave her with anyone. But the vet called me and informed me that the splint was too tight and did not allow blood flow to her leg and it was dead. I knew my baby was in pain the only course was amputation. I am so scared I don't know what to expect when I pick her up. I am military and my Lilo provides a lot of love and comfort to me. We are getting ready for an assignment in Korea and I want her to go with me. I can't leave her. After reading others story I feel so much better and will take the advice that was giving and try to be normal as possible. Cheryl, I hope your pup is okay and recovers quickly! I'm glad you found this page helpful. Best of luck to your pup! Hi. I just made the decision to have my 8 month old Shepard mix's leg amputated. Almost two months ago Kira hurt herself somehow overnight. She was limping, so I took her to the vet the next morning. They didn't find any sort of break or anything on x-rays and they believed she just bruised it badly and she'd be fine in a few days. She was sent home with pain meds and to told to try to make her take it easy. The next evening, her leg began to swell up HUGE. I took her back in to the vet and they kept her overnight for fluids, observation, and for them to figure out what exactly was going on as well. They figured out she had a form of strep. It nearly killed her, but she made it through. She had some sort of leg injury in combo with a tiny wound that we were finally able to find when her swelling went down. But when her swelling went down and she was recovering, she still wouldn't use her leg anymore. I took her back in and found out that the infection destroyed her cartilage in her knee. So, my options were to have knee replacement surgery, or amputation. We decided amputation because she is so active it would be very difficult to afford the surgery ($2000+) as well as keep her down for 8 weeks to recover. I am so thankful for finding this page. I have been heartbroken over this, but seeing these success stories has really made me feel confident that she will live a great life still. Amber, it sounds unusual that your dog didn't get painkillers. Did the vet schedule a follow-up exam? You should follow up with them or a different vet to get pain meds. I know that my dog got 3 different types of pain meds. One was an anti-inflammatory, another was a Fentanyl patch that provided medicine through her skin, and a third was a little tube that provided Lidocaine to the area. (I don't remember my dog having a bandage.) Get a second opinion, if you are worried. Thanks for rescuing the dogs. I hope your pup is doing well now. Today me and my husband rescued a Chi from a local animal shelter when they had got her, her front leg and been broken for so long they had to remove it. We got her less than an hour after she got to leave the vet. No pain meds or anything was told she had got a shot before ahead left and it would last a while. 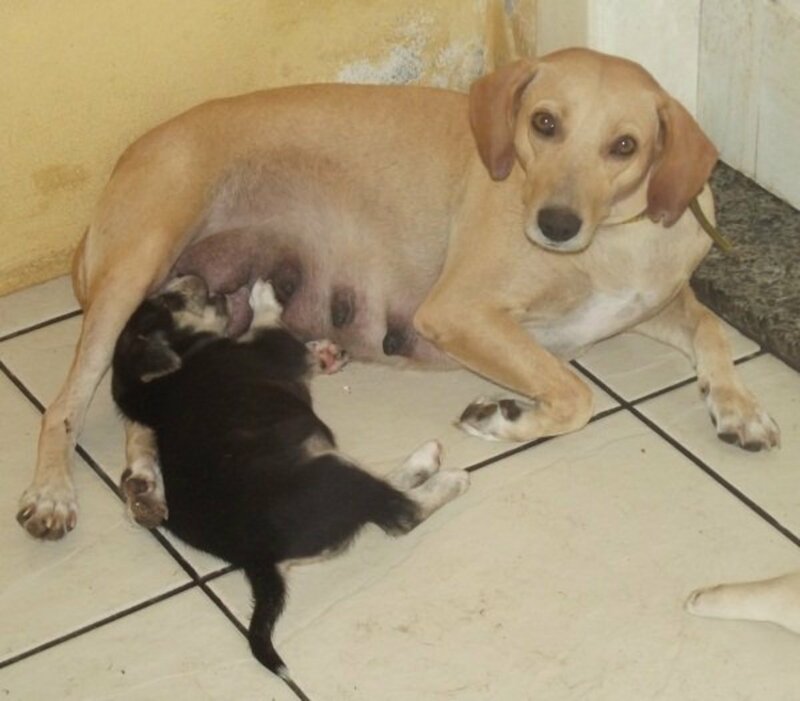 We also adopted her son who is very attached to her they both are doing good as for me I have a soft heart and it is veRy heartbreaking for me. I am worried she is gonna be in a lot of pain or something could not be right seeing the pictures of other dogs who was going home having a bandage around them she does not she has ten staples and when I was looking at them to count them I touched her just barley and she cried but seems fine now. I just don't know what to expect or not to please help me! Cindy you will be so surprised at how easily dogs adapt to this. Most dogs are out there peeing & pooping on their own within a day or two. They reposition their legs for better balance and it's not a problem. Thanks for the 3-paws up Kiri! Our male pups Jerry & Wyatt never had a problem figuring out the potty business, most boydogs do just fine. I'm sorry to hear about your pup. When my dog had her front leg amputated, we really only had to hold her up and help her walk on the first day and then a little less on the second day. It was either the afternoon of the second or third day that she figured out how to go down the three steps to get outside, with us gently guiding her in case she lost her balance (which did happen a few times here and there). Learning how to go up stairs took longer. As far as relieving herself, she was fine. But, it might be different for a male dog. Check out tripawds.com...they have a ton of info and a forum. Best wishes to you and your dog! Our dog needs his front leg removed due to cancer. One of my husband's concerns is our dog is relieving himself. We understand that we will need to walk with him and hold him up but will he be able to considering balance and everything. He is a large dog. Stephanie I'm sorry to hear your dog is going through such trauma. Sending a dog home without pain meds is criminal, and your vet letting that wound get to that point is crazy. Find a new vet asap if you want your dog to survive this ordeal. Hugs to you both. Good luck! Stephanie, I hope your dog is okay. It sounds odd that your dog didn't get pain meds. My dog had front leg fully removed 1mo. Ago and since has lost almost all his blood.... And been stitched twice. And still has an open hole in chest big enough to put a golf ball in. They did not even send him home with any pain meds... Does this seem right? Yup, you will be amazed at how well dogs adapt. It is inspirational. Diana, your vet is correct. 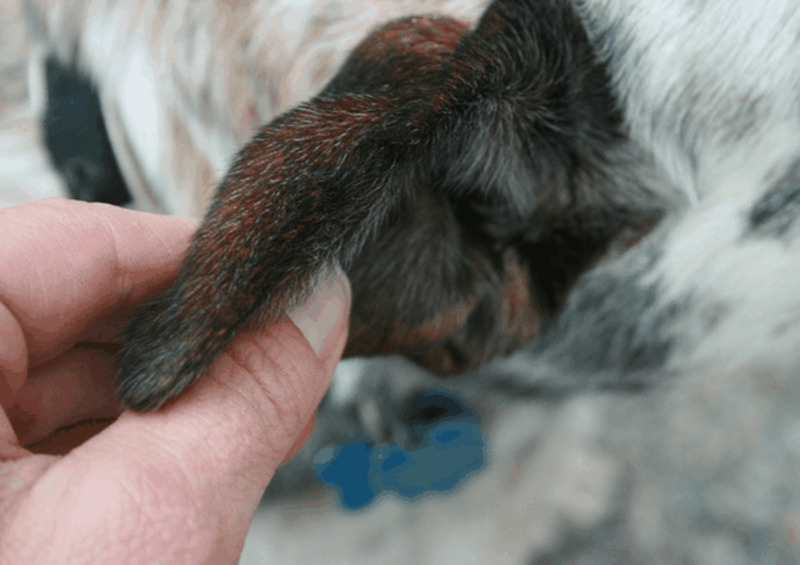 Many dogs with partial front limb amputations end up having healing difficulties, the limb gets banged around too much, etc.. We frequently meet members at Tripawds because their dog had to go through a full amputation after a partial one didn't heal properly. Try not to worry, your pup will be fine. Her size is a big asset when it comes to being a three-legged pup, you'll be surprised and amazed! Definitely! Our pup looked to us to see how we'd react when she was getting accustomed to life with 3 legs. Remember, a strong pack leader makes for a much easier recovery!